The recent demise of MegaUpload has highlighted the need for contingency plans that deal with the failure of Cloud services. Central to such plans is the ability to export your data from the Cloud. That’s where Google’s Data Liberation Front comes in. They provide tools and guidance on how to “liberate” your data from a variety of Google’s Cloud services. The DLF’s Google Takeout allows you to download all of your data from several Google services in one fell swoop. Other Google products need to be dealt with individually. Google’s DLF initiative is a smart move; rather than trying to lock you into their services by making your data inaccessible, they’ve made their Cloud services more attractive by giving users full access to their data. Having the ability to export your data from the Cloud allows you to make backups, create archives and switch service providers. If you have critical data with any of Google’s Cloud services then make use of the DLF to regularly export it. Dropbox (affiliate link) is one of our favourite file-sharing services, and now it’s got even better, with Dropbox for Teams. The idea with Dropbox for Teams is that you can now use this on an organisation-wide level, with better control for administrators, better collaboration between users, and better security for corporate purposes. If your organisation’s IT department has been leery of you using a Cloud-based service like Dropbox, tell them about Dropbox for Teams. One of the key ideas we present in “Out of Office” is that the advent of Cloud Computing has made telecommuting easier than ever before. Cloud Computing gives you access to the information resources you need for work wherever and whenever you have Internet access, whether you’re in the office, working from home or on the road. Ben Kepes from Rackspace (a Cloud Computing infrastructure provider) gives a brief introduction to Cloud Computing in the following video. Google Docs, at docs.google.com, is a free service from Google, which allows you to work on documents collaboratively. This saves money, because organisations don’t have to buy software licences. There are no problems with people using different versions of the software and creating incompatible documents, because everybody is editing the same document using the same software. Everybody is editing the document live on the Internet, which reduces the chance of two people accidentally overwriting each other’s work. Because it’s on-line, Google can add extra features to help collaboration. For example, Google Docs provides a handy chat window to the side of the document you’re editing, so if you’re working on a document simultaneously, you can comment to each other as you’re making your changes. For example, we also run a monthly podcast, called the Focal Point Podcast (see www.FocalPointPodcast.com). To prepare each episode, Chris creates a blank Google Docs document for the coming topic, and we both then add to it in the weeks leading up to the recording. On the day of the recording, we both open up the document, and mark it up with last-minute changes. You don’t have to start your documents from scratch. Instead, you can upload existing Word, Excel and PowerPoint documents to Google Docs, which imports them into its own format for you to edit. We’re big fans of the Cloud (that is, using the Internet as your “computer”) – after all, it’s what makes much of the Out of Office work style possible. In fact, the more we explore it, the more we see people using it in new and innovative ways. Lifehacker magazine has an excellent blog post, “Top 10 Clever Uses For The Cloud”, with some interesting, thought-provoking and – yes – even clever – ways to do stuff on-line. We love Google’s free Cloud-based services for managing your information. It’s not just Gmail, either – you can now keep your calendar, documents, reminders, blogs and other material in Google’s “Apps”. 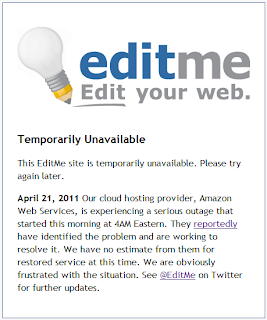 The wiki is hosted in the Cloud by a third-party service, EditMe.com, and it turned out that their Web host experienced a major problem. The big news – as you might have noticed from the message above – was that the Web host was Amazon Web Services (yes, that Amazon), a service that provides Web hosting for many of the largest organisations in the world. So many of them weren’t functional either. Luckily for Gihan, most of the downtime was overnight, when he could make do without access to the wiki (and it’s a private wiki, so it only affected him and his team). But for many other providers – especially those in the USA, where it happened during a normal working day – it was a significant problem. This is one of the problems with using the Cloud: You’re relying on other providers to keep your data safe and accessible. If we had it on a local network, we wouldn’t have been affected by the Amazon outage. However, that’s not the best solution for Gihan. He put the wiki in the Cloud because he didn’t want the overheads and costs of a local network. If it has an occasional outage, it’s not the end of the world – especially as he takes regular backups of the data. Your mileage might vary. Whenever you put anything in the Cloud, do a risk assessment – even an informal one – and plan for what happens when things go wrong. This is not a reason not to use the Cloud (although you might decide the risk is too great for some things); it’s a reason to use the Cloud appropriately. You are currently browsing the archives for the The Cloud category.